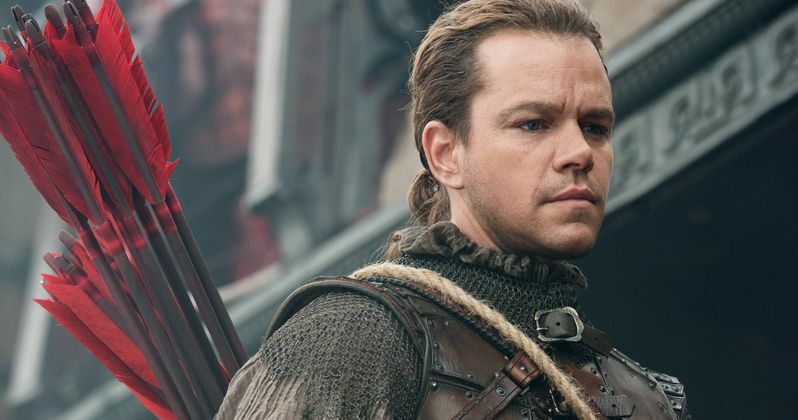 When the first footage from The Great Wall hit earlier this summer, many genre fans complained about the movie's leading man, causing a white wash and white savior controversy that is still plaguing the February, 2017. Today, star Matt Damon brought the movie to NYCC 2016, and he decided to face these allegations against his Chinese set supernatural thriller head on. Shortly after a panel for The Great Wall, which saw the release of a second trailer, Matt Damon and the filmmakers behind the movie gathered for a press conference. During the Q&A, Matt Damon was asked point blank about the white wash and white savior controversay. And whether or not he considered the idea of a white hero in a Chinese set movie offensive. The actor was quite passionate in his responce, and answered the question frankly. He says this. "It was a fu**ing bummer. I had a few reactions. I was surprised, because it was based on a teaser. It wasn't even a full trailer let alone a movie. To get those charges levied against you... What bummed me out is I read The Atlantic religiously and there was an article in The Atlantic. I was like, 'Really, guys?' To me whitewashing was when Chuck Connors played Geronimo. (laughs) There are far more nuanced versions of it and I do try to be sensitive to that, but Pedro Pascal called me and goes, 'Yeah, we are guilty of whitewashing. We all know only the Chinese defended the wall against the monster attack. Look, it was nice to react a little sarcastically because we were wounded by it. We do take that seriously." Matt Damon's co-star Pedro Pascal was also on hand. And he had a few things to say about the White Washing controversy. But he didn't want Matt Damon quoting him. He explains this. "Don't quote me! We don't want to be kept from work that they wouldn't have the opportunity otherwise to see that is very specifically Chinese. It is a creature feature. It's a big, fantastical popcorn entertainment movie, but it has a visual style that is Zhang Yimou's and his only." Matt Damon went onto talk about the controversy. And he calls it bad for the marketing team. He says this courtesy of ComingSoon, who were on hand to record his comments. "From a marketing perspective, what's a worse wipeout for a marketing team than to have that happen as a backlash against a teaser you put out? They're trying to establish a number of things within a minute. It's a teaser, they're trying to tease the monster. They're saying it's a visionary filmmaker that Middle America probably doesn't know. It's the Steven Spielberg of China, right? Don't worry! They speak English in this movie. You hear my voice speaking English. Don't worry! Matt's in the movie, you've seen this guy before. They're trying to establish all these things, and by the way, there are monsters. Then 30 seconds and you're done. There's a lot of pipe they're trying to lay in 30 seconds, and I watched that teaser a number of times to try to understand the criticism. Ultimately where I came down to was if people see this movie and there is somehow whitewashing involved in a creature feature that we made up then I will listen to that with my whole heart. I will think about that and try to learn from that. I will be surprised if people see this movie and have that reaction. I will be genuinely shocked. It's a perspective that as a progressive person I really do agree with and try to listen to and be sensitive to, but ultimately I think you are undermining your own credibility when you attack something without seeing it. You have to educate yourself about what it is before making your attack or your argument and then it's easier to listen to from my side."